Landscaping your yard is often one of those jobs that you constantly put off. Both time and money can be an issue, and this article is focused on reducing one of these problems, that of money. No, not reducing it that way! Reducing it in the not-needing-so much-of-it way! You can turn your backyard into an attractive area without breaking the bank. From finding ways to make a plant pot of flowers look unique, to building your own meandering walkways. There are many ways you can landscape your yard on a budget, making it a comfortable and attractive place. The first step is to consider your yard, the size, configuration, light exposure, noise exposure, and general ambiance. Then start to ponder what you would like it to be. Think about focal points, features, usability, and the like. Do you want to have a large lawn for the kids to play on? A quiet garden full of plants? A bountiful vegetable garden? All of these options and more are viable, even at low cost. Let’s look at some of the basics for outdoor spaces to get started. Small can still give you lots of pleasure. Make it an extension of your living room and fill it with color and scents. Use a conversation set rather than a patio dining set to make your environment more comfortable. You can still have a play area for the kids, alongside a relaxing seated area for the adults. Elevated, Raised Planters will add color and attract pollinators such as bees and butterflies. When you get home from a busy day at work, this could be the perfect place to de-stress. It can be minimalist, but also colorful. From hedgehog houses to modern birdhouses, beehives to bat houses. These gardens are specifically designed to attract animals, friendly insects, and birds. Large shrubs and graveled walkways come to mind, or even a swimming pool. This style of a garden will encompass plants such as lavender and vines, all tolerant of droughts. The use of natural materials here can be very helpful, striking, and beautiful. Reflecting the famed English summer gardens. It will be filled with sweet-scented colorful blooms and an array of different border plants. Such a garden reflects the romance of the countryside, but can still be replicated in your average urban yard. Takes on a style of balance, with symmetrical or geometric designs. Usually has a grand centerpiece, such as a water feature, plant, or statuette. Not quite as fussy or noisy as the cottage style, but still encompasses landscaping beauty. From smooth clipped edging to symmetrical planters, it will feature straight lines and neat rows of fauna and furniture. If you’re lucky enough to have a large plot, then plan it in different stages with different themes for each section. If your yard is small, then it can look just as good. Have a look at our handy tips, all created with the smaller budget in mind. A birdbath, solar fountain, or other minimalist water structure can go a long way here and doesn’t need to be expensive. Should you live in a cold environment, a sauna can be a great focal point in the yard. Outdoor ponds and garden waterfalls can get pricey, but they don’t have to be. 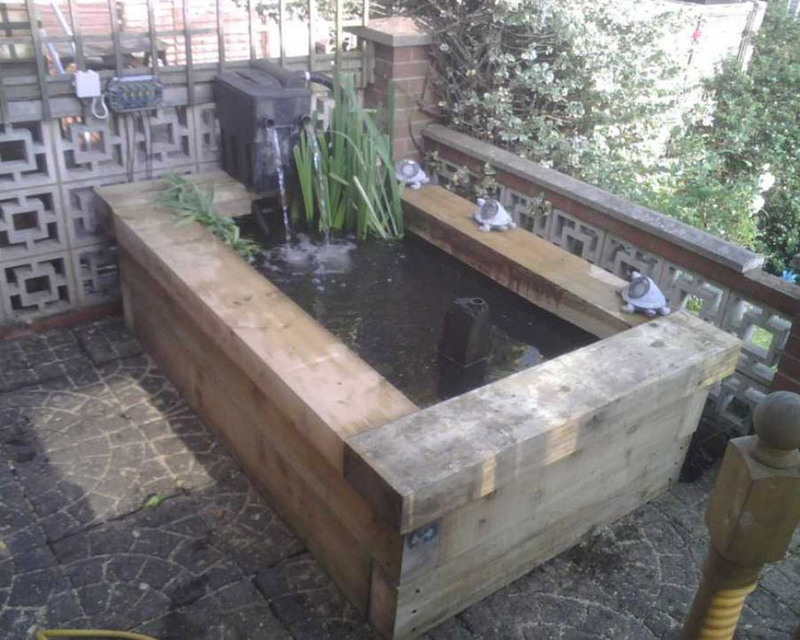 There are many pre-made ponds and fountains, though as our links show, there are loads of DIY Water Features easily within most homeowner budgets. While we definitely lean toward the outdoor living environment rather than the outdoor dining environment, an outdoor dining room spot can be a great focal point. If you like to DIY, be sure to check out our concrete patio furniture inspiration for some great inexpensive outdoor dining ideas. Be sure to check out our Patio Furniture Deals to find the latest sales and bargains! Focusing your outdoor area around a fire pit or chiminea is never a bad idea! Fire pits and chimineas provide warmth, ambiance, and illumination all in one package, so they are a great solution. You can even cook on a fire pit or chiminea if you’d like! If circulation is crucial in your patio or garden space, you could use the walkways themselves as focal points. This can be accomplished using special lighting, materials, or design. See below for inspiration. If you love to garden, a potting shed can be a great option on its own! We love the look of wooden sheds, but the resin shed is the dominant choice due to its ease of maintenance. 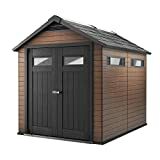 If you haven’t seen them, be sure to check out the Keter Fusion shed, as has the best of both worlds! Storage capacity: 310 cu. ft.
Everyone loves swinging chairs and beautiful hammocks. They look amazing, are great for kids, and are often super comfortable. They drip summer! Beautiful flower beds in their full glory can be perhaps the most beautiful outdoor experience possible! Seeds and bulbs are often quite inexpensive, but of course, require significant work! Vegetable and herb gardens are wonderful additions, and we feel they belong in the front of the yard as much as the back of the yard. Too long have they been relegated to ugly spots. Of course, many municipalities and HOAs disagree, so be sure to check before you start planting vegetables and herbs in the front yard. Also, interspersing fragrant herbs through the flower garden is a great idea! Raised Bed Planters can be an outstanding way to organize your garden, and create features and focal points. Use an on the ground planter for larger options, and be sure to consider tiered planters for style and functionality! And elevated, raised beds can be quite useful for those who don’t want to be on the ground all the time while gardening. For those with a smaller plot, you might be best to consider using planters in varied and imaginative ways. Let’s look more closely at the Planters category to get some further cheap landscaping inspiration. First, decide what you want to grow, such as vegetables, herbs, flowers, or a mixture of them all? All can be achieved, even in a small plot, by the clever use of planters and raised beds. This cool raised bed, photographed from above, has multiple tiers in interesting patterns. Use any old ladder for shelving, as a modern feature. Lay a board across the steps for holding an array of herbs in their pots. If you don’t happen to have an old step ladder, you can paint a new one. This is perfect for smaller spaces as the presentation is vertical rather than horizontal. With little landscaping tricks such as this one, you can grow just about everything. If you want to grow vegetables but feel that you lack the space, then just get inventive. A variety of vegetables can grow in as little as four inches of soil, and any vegetable can grow in a raised bed. Have a look at our section on planters to give you some ideas. Terracing varying sizes, Plant taller flowers at the back, gradually going down in size towards the front. On the borders use ground covering plants that give off lots of colors. Hanging pots of colorful blooms that dangle. Vines that climb up trellises attached to walls and fences, or even twist their way around arches and arbors. If you’re a beginner and don’t feel ready to experiment with colors, then start with lots of mixed greens. There are many shrubs and grasses that don’t flower but can still provide an attractive display of leaves. Topiary can be just as flamboyant, as you can trim shrubs and trees into any shape you desire. This, of course, requires a good deal of patience and training to do right! Another option is to pick up some artificial topiary and blend it in carefully with your natural environment. It can still look amazing, and there’s no need to learn how to take care of it, and constantly work with it. There are so many household items that you can turn into an attractive planter, all it takes is a little imagination. A planter can be used for growing an array of eye-catching flowers, or for vegetables and herbs, which can look equally as dazzling. Bathtubs, especially if they have legs, can make great raised beds. This one is very fun, and we love the paint on the tub! Fill it with blooming colors, or even vegetables and herbs. When they are fully grown, it will become a key feature in your garden. These old tubs can often be found in junkyard sales, or maybe you’ve already got one hanging around. The biggest investment will be filling it with soil. Layer it with rubble and sand at the bottom. Drill in some holes for drainage. Any old soil will be fine in the middle. Use a decent topsoil with a layer of compost at the top, to feed your newly planted crops. Old broken wheelbarrows make attractive planters too. When it’s time to buy a new one, keep the old one and repurpose it into a planter. Old wooden boxes, or new ones, make great rustic planters! Use old crates, or make your own from cheap timber. The more homemade it looks the better, to give it that aged rustic effect. Line it with a membrane so the soil does not fall out. A barrel cut in two lengthways can also look amazing when laid out and filled with colorful blooms. You could even make window boxes to hang at the bottom of your window frames. It will transform the outside of your home, making it colorful and welcoming. 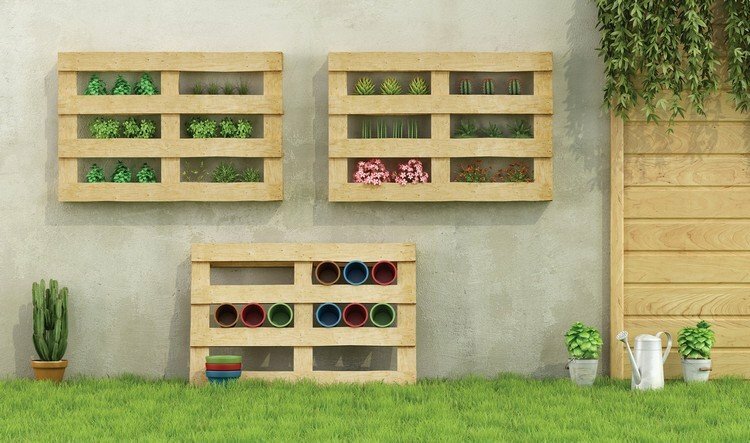 If you have a solid fence or wall, attach planting boxes on them. This allows you to plant trailing foliage, letting it hang down appealingly. If your fence or wall isn’t particularly attractive, this is a great way to add some color to a drab area. 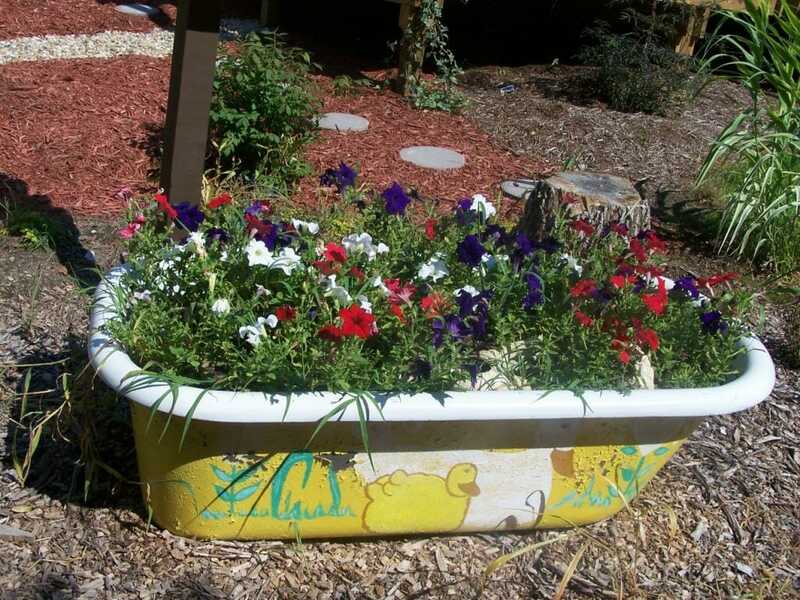 By making your own planters, you can paint them in your favorite colors. Alternatively, attach a wooden pallet to your wall. Remove every other slat for space, and use the wood on the remaining slats to make shelves. Vinyl guttering pipes can be useful for seeding. They will transform your fencing or walls, with long lines of colorful blooms. 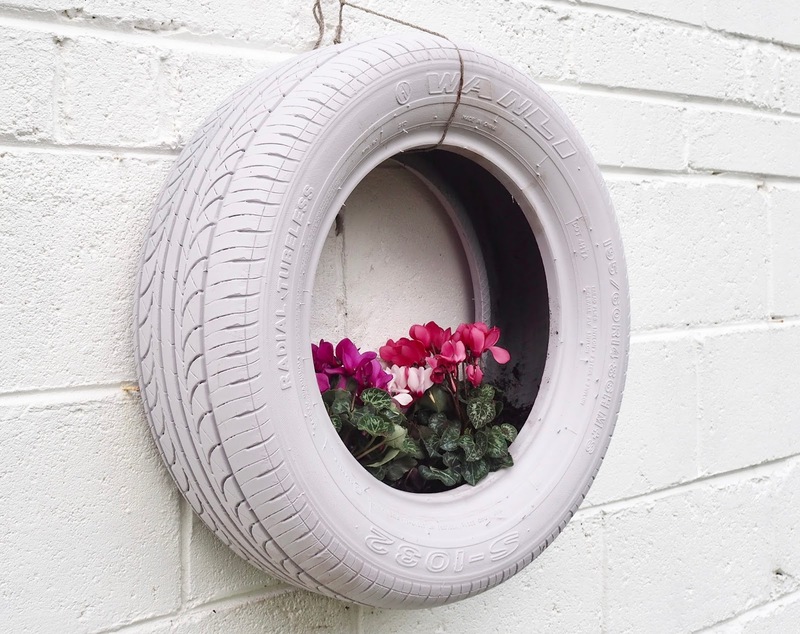 Even old tires can be turned into bright planters. Painted they can look quite unique. Put one tire on top of another, giving each a base, and you have another raised bed idea. Tires look great hung on walls too. Paint it an attractive color, and plant flowers on the inside. If you have a larger garden then you may be having trouble getting around without. Often finding yourself treading on flowerbeds, or trudging through the mud on wet days. A great way to get around this problem is to create pathways meandering through and around your piece of land. This is a task that can be done for a small cost, along with a bit of hard work. The obvious one that many go for is a concrete patio walk. Given a flat base with some sand and gravel as a foundation, this can work well. Though it can be a little plain. Wooden pallet slats can keep the cost lower, and look amazing. Again, dig that level ground where you want to place your pathway. It’s always better to give it some foundation of gravel or sand if you can. Though you can lay them directly on the earth, they may be prone to sinking. This makes a simple and attractive pathway and is easy to repair if one of the slats breaks. Wood can get slippery when wet. To stop this, treat them with a sealer and sprinkle in some sand while the sealer is still wet. It gives the wood a gritty finish. Using old reclaimed bricks and other building waste can make an interesting pathway. Again, you need a level base with foundations, such as gravel or sand, and then a layer of mortar. Embed your bricks into the mortar while it is still wet, using any pattern you desire. Once the mortar is set, grout it and add a sealant. Play with the patterns, lay a wide or a narrow walkway. Bend it or have it in a straight line. Whatever pathway you design, it is sure to make a big difference to the landscape. Be sure you use patio bricks, as opposed to fireplace bricks. Fireplace bricks will likely not be able to stand up to the weather and will crumble in a couple of years. Make a template of the shape of the stepping stone, using timber. This can be round, square, hexagonal, even stars. Create any shape you desire. Pour mortar into your template and let it settle. Now for the creative touch of putting in a layer of colored pebbles. Play with the pattern by using differing sizes, shapes, and colors. You could also use slate or even large shells for the filling. Finish off with grouting, and a waterproof sealant. Now put them anywhere where you don’t want to step on flowerbeds or grass, or even make an entire pathway by laying down many. If you get good at this technique, you could move onto this: Wow! What is any garden without a colorful array of summer blooms? Depending on your local clime, flowers can bloom all year round, even in the colder months. Play with colors from a bright purple setting, to simple greenery. What type of soil you have? Your local climate. Do you have seasons, or are you hot or cold all year round? Identify the shady and sunny positions in your plots. Is the plot sheltered with walls or exposed to the elements? You must consider the growing conditions before you choose your plants. Only then will you ensure healthy and colorful growth. Whilst it is possible to make changes to the topsoil, over time, particularly so in planters, it is not possible to change the weather. Do your homework and see what your neighbors are growing. This should give you an idea of your local growing conditions. 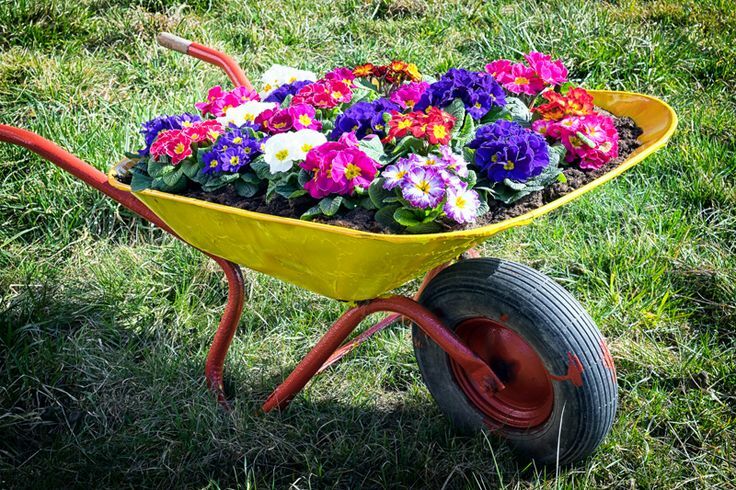 Consider how much time you have for tending of your flowerbeds. If you have a busy life, choose plants that do not need lots of attention, such as shrubs and grasses. There are also plenty of ground-covering plants that you can use to inhibit weed growth. Perennials that come back for years. Annuals that grow for one year only, but are cheaper to buy. You could also use certain herbs, such as mint, rosemary bushes, or creeping thyme. Not only do they spread out and smell wonderful, but you can use them in your kitchen. By using various flower beds in your landscaping, you can build up different designs in each bed. You are in control of your budget but bear in mind that perennials and bulbs will return year after year. Of course, annuals are typically cheaper to buy. If you are lucky enough to have many flower beds, add plants that will flower at different times of the year. Plant around five in every meter of your flowerbed. They don’t need to be the same plants, but it is good to have clusters of three-five of the same plants together. This creates a uniformity of texture, size, and colors, and you’ll always have something blooming at any given time. Shrubs are a good way of marking out private areas and can act as very attractive walls. Choose shrubs that will flower or even provide you with fruit. Tall trees will provide good shade and make your garden appear bigger. Though a tree uses lots of underground water, so not much will grow around the tree. You could plant some of those ground covering plants we mentioned earlier. Be sure to throw on a Treegator for the first year to help get your trees established. Many shrubs and trees are permanent features, so there is only the initial expense to consider. This is cost effective if you maintain them well by keeping them trimmed so they have a tidy appearance. A water feature is an attractive addition to any garden, large or small. This could include a koi pond, a raised well, an ornamental feature, or even a swimming pool. Though we can’t instruct on how to install a swimming pool in this article. 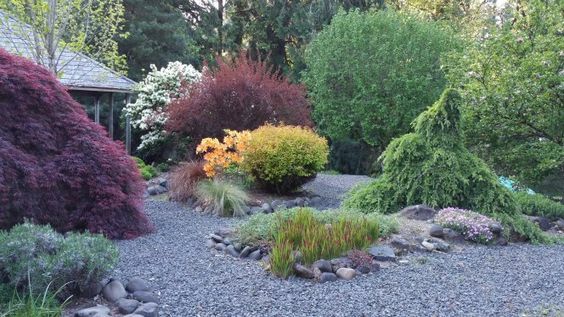 There are a couple of major varieties of ponds, primarily those that are dug into the ground (“natural”) ponds, and those that are raised up off the ground. How large your pond is, depends on how much room you have in the garden. It could be a standalone small water feature, dug out to the size you choose, then lined and filled with water. If you want a fountain feature in the middle, all you need now is a solar powered fountain! These units make setting up fountains way easier than they used to be! Edge the pond with decorative stonework or plants. If you want fish in your pond, then you should surround it with plants for natural biodiversity. Oxygenating plants, such as water violets, not only provide the fish with oxygen but also with food. Pondweed, water moss, milfoil, and watercress, are all perfect for fish. Marginal plants grow around the water’s edge, such as Anemopsis Californica. These have a delicate white bloom and roots can be planted below the water surface, or above. Equally so with March Marigolds and Flowering Rush. These can all be planted at the sides of the pond and will be happy to spread their roots into the surface of the water. By using moisture-loving plants around the margins of your pond, you have created a haven for wildlife. Build a raised well with stones or timber. You could even make it wide enough to be a seated area. With a raised pond, you will not need to dig a large hole. Though you will need a solid flat paved, concrete or gravel foundation. Want to build it yourself to save money? Lay out your timber such as railway sleepers, or your first row of bricks, in the shape you desire. Fasten them together with Timberlok screws, if using bricks then building mortar. Overlap the joints as you add more layers. Each layer needs to be solid. If it is wood then strengthen the layers with a batten or metal strip so it interlocks. The last thing you want is the whole thing toppling over. If bricks, allow your construction to dry out before you finish the final layer. Before the final layer is added, lay the membrane liner inside. Allow it to overlap the top of the wall. Incorporate the overlapping liner into the structure, held in place with the final layer. Don’t use creosol treated wood if you are adding fish to your pond, it will contaminate the water. Now add your water, plants, and fish. If you don’t have space or don’t like the idea of a pond, but still want to hear the sound of trickling water, then build a water feature. Find a plot of your garden of around a meter squared, for its location. Flatten it and plant 4-5 moisture-loving plants in a design to suit. Add a thick layer of large pebbles to cover the square ground, being careful of the plants. Bury some pumped jets for the water flow. Hide them in an urn or pot for decor, or simply have the water jet flowing freely across the pebbles. Or, how about a water pump fixed to a wall with a decorative covering? The water needs to fall into a receptacle that has a submersible pump in it. This recycles the water flow. Surround the wall feature with a climbing plant, such as ivy or sweet peas. Nothing beats an ambiance of subtle lighting in a room, and the same goes for your backyard. Sit out on your patio and enjoy the trickle of your water feature, along with the outdoor illumination of your landscaped garden. Create a relaxing atmosphere in the evening, that makes you want to sit outdoors instead of watching TV. Plus, good lighting is a great security feature for the safety of your home. Fairy lights and string lights can add a warming, but dim glow to the seating area of your patio, and they add charm to a tree. Alfresco dining is enjoyed so much more with a little intimate glow. If you have a pergola to light up, then intertwine the wires so they can’t be seen. Nothing worse than messy wires indoors or outside. If you don’t want to use electric lighting, try using candle lanterns, citronella burners, and metal torches. Highlight natures world by shining up your plants and shrubs. Place them to glow on a rock, to mark a garden path. By using mosquito-repellent fuel (we like eucalyptus!) you can help keep the mosquitoes away while improving the ambiance. Win-win! Use solar powered LED lighting around the pond or water feature, to bring it to life in the darkness of the night. 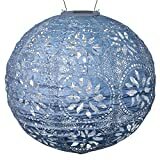 For these, look no further than the Allsop Home line of outdoor lighting! Line a walkway with solar-powered path lighting that is designed to simply stick in the ground. All bringing the daylight sun into your evening garden. From gardening to plants to patios and walkways, lighting to fire to mosquito-protection: a little can go a long way to creating the perfect outdoor environment for you and your family. We hope this article has given you some great inspiration and cheap landscaping ideas. Now get to work and start implementing all those plans and designs!